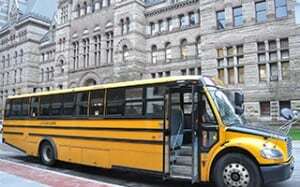 If the cost of a luxury coach party bus doesn’t fit your budget, then why not consider renting a yellow school bus instead? 1. It’s cheaper than coach, so you’ll save a ton of cash. Save that money for a rainy day, or spend it on other aspects of your event – the choice is yours. Either way, you can’t argue with the magnetic attraction of keeping more money in your pocket! 2. It’s great for short and long trips. Remember field trips as a kid? School buses were used for everything, from short jaunts to longer drives across town. And they can be used for your next event too, no matter the length of the drive. 3. It’s great for large events. If you have a lot of people to transport, we don’t think you’ll find a more cost effective, low-stress, way of doing it then a yellow bus. We can fit a lot of people comfortably in our buses, and you can book as many buses as you need. 4. It’s fun to re-live childhood memories. Let the “Remember when…” and “When I took the school bus…” stories begin! Battle for the best seats (in the back of the bus, of course! ), and enjoy the fun of talking to your seatmates. If you really want to go hard-core in re-living childhood memories, feel free to assign seats and have anyone who misbehaves sit right behind the driver. 5. It’s a safe and effective method of travel. Our buses our driven by a professional, experienced driver. We’ll get you where you want to go safely and on time. Did you know? School buses, along with trains, are reported to be the SAFEST method of ground travel? 6. School buses are a green method of travel. The typical journey by school bus will use less fuel per passenger compared to what they’re likely to use if they all use their own vehicles to get to your event. 7. Rent a bus so no-one gets lost and everyone arrives on time. By taking care of the transport needs of everyone, you ensure that everyone arrives when they are supposed to, with no stress. And the last thing you want is to have your guests worrying about how they’re going to get themselves to your event, right? What Will it Cost to Rent a Yellow Bus? How many buses do you require? How many people are being transported? Think Yellow Bus – You Can’t Go Wrong! A yellow bus is a great choice for any event. You’ll save money, your guests will get a kick out of riding in a school bus one more time, and it gets attention. If you’d like a price on a yellow bus or party bus for your group trip anywhere in the Greater Toronto Area or throughout Southern Ontario, get a quote now!